The new portrait-style Hideaway E Electric fireplace by Avalon is easy to install, ready for plug and play operation and comes with choice of optional faces and interiors. 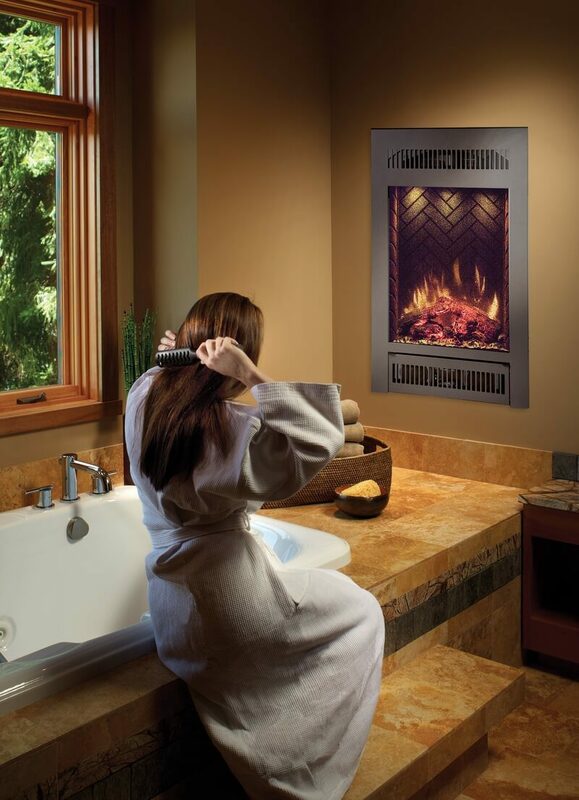 The Hideaway E features pulsating, glowing log set and ember bed features patented, realistic LED flame technology. You also have downward pointing LED accent lights that illuminate the logs and interior to give a three-dimensional depth to the fireplace interior. The Hideaway E plugs into any standard wall outlet or can be hard wired in. The standard remote control gives you: flame on/off, variable interior lighting, adjustable flame speed, heater with blower, thermostat, sleep timer and child-proof lockout. The 1200 watt electric heater and blower will add comfortable warmth to an area up to 400 sq. ft. which makes it ideal for supplemental room heating. The Hdeaway E Electric fireplace is designed for pre-built cabinets, or it can be built-in with standard stud framing and facing. Drywall, tile or stone can all be accommodated. What makes the Hideaaway E Electric unique is the built-in audio system that is ready to connect with your iPod, iPhone, mp3 player or streaming audio. Two built-in speakers,a 24 watt amplifier with high-fidelity playback and a mini-jack auxiliary connection cable are ready to plug and play. The standard 21 E 21 remote also operates the audio system with on/off and volume control.